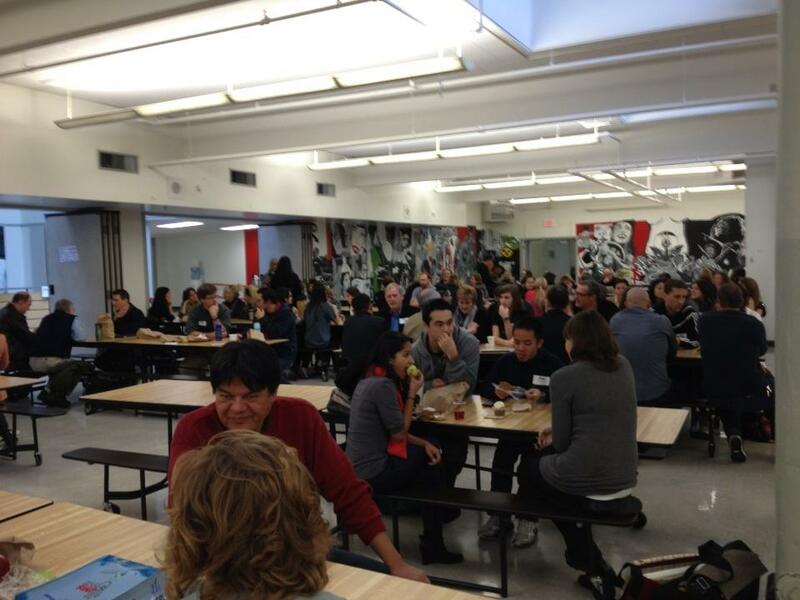 The dust has now settled following Saturday's Edcamp Leadership BC. As participants, the nearly 200 of us have now gone our separate ways, back to our roles as students, parents, teachers, administrators, etc. Before time escapes too quickly, it's important to do some reflecting. As an organizer, the days leading up to Edcamp were busy and filled with uncertainty...Who will show up? How many people will participate? What topics will participants propose? By the time Saturday arrived, it was almost a relief because I too could be like everyone else...a PARTICIPANT. 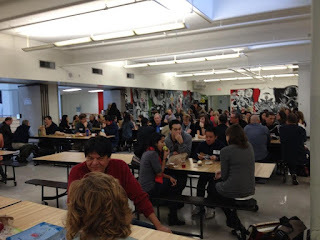 Having participated at two previous Edcamps (Edcamp Vancouver & Edcamp Delta), I am well aware that a major aspect of an Edcamp is the opportunity to form new connections and strengthen existing ones. It's also a time when many people who are unable to participate in face-to-face discussions, contribute to conversations through Twitter. To kick off the day, I challenged participants to at the very least, take one connection they were about to make during the day and continue to strengthen this connection through conversation beyond the unconference. The amazing number of face-to-face conversations on the day and ongoing interactions on Twitter that continue to use the #edcamplbc hashtag are a positive sign. I encourage you to check out the links to the Google Docs from each session, access the Twitter list of people who participated face-to-face and contributed from a distance and some of the blog posts that participants have written since Edcamp Leadership BC. I participated in three sessions: 21st Century Teaching and Learning with Technology, Engaging Aboriginal Youth and Connected Leadership. During the Connected Leadership session facilitated by David Wees, Ron Canuel from the Canadian Education Association (CEA) made a comment that really stuck with me. "We need to surround ourselves with opposing ideas in order to create a richer context." Ron's comments got me thinking about the nature of Edcamps. Edcamps, while highly inspirational are very much about 'preaching to the converted'. Those of us who attend Edcamps do so because we see a need and are interested in making progressive change in education. But while we may be making changes to our own practice, are we actually creating widespread scalable change? Although I wasn't an educator at the time, I tend to agree with the idea behind another of Ron's comments. "Many of the issues we are talking about in education we were still talking about in 1988. Change is stressful, what do we try to do? We try and reduce stress (which means we work against the change we want to see)." Why is it that we continue to repeat the same conversations? I'd argue that too often we are afraid to wade into uncomfortable conversations where we may be challenged to justify and defend our positions. As a result, we become content to limit our exchange of ideas to our own mutual admiration society. So when it comes to Edcamps, it's great to hear what people in other areas are doing and to glean some inspiration from fellow participants, but in order to trigger widespread change we must communicate our ideas beyond just Edcampers. We must engage those who hold differing and opposing views and provide a convincing enough argument that they see reason enough to change. So with some encouragement from Lynn Oucharek, I closed the day challenging participants to take an idea that they had heard at Edcamp and share it with someone who didn't attend and quite likely has a differing opinion. These are the people with whom we must share our ideas with and have the courage to enter into deep, rich dialogue with. As educational leaders, it is our responsibility to help others see what we see, see what is possible and how together we might get there. This is necessary so that in 10 years, we aren't saying, "Many of the issues we are talking about in education we were talking about at Edcamp Leadership BC 10 years ago!". Congratulations on a successful Edcamp. Its great that Canadian educators are taking such an activity part in these conversations (compared to other countries). On your reflections about 'preaching to the converted, ' while I agree that in a situation such as Edcamp that might be the case it is also much needed. It is where the inspiration and the drive to carry forward comes from. While it is good to question why the same conversations are still going on 10 years later, I am not sure that the reason is because people who were at the fore-front 10 years ago in their thinking about technology and its impact on education are going around in circles - I think its because the rest of us are just catching up. The field moves way too fast and there are too many schools and educators for who the possibilities of technology did not come to the forefront until quite recent. I am one such educator for sure - I am 'just' entering the conversations -not because I am anti-tech or anything but just because it was not on my radar in the same manner. Interestingly I find the I will have an AHA moment, be all fired up and then find out that one of the people who were probably at Edcamp 10 years ago have already said it and said it WAY better than I ever could! That's the beauty of the internet though -access to information and experts :-) I can't imagine that I am alone - just by virtue of the place we occupy on this continuum of educational change there are a bunch of us out there - excited by the change, eager to do what is best for students and yet not as knowledge about the area as the people who either were the early 'specialized' or those who are coming with a digital natives perspective. Changing leadership visions, abilities and conversations. Encouragement for those of us who come just prior to the digital natives/i-generation. Continued conversations with people who have been forging the way. Perhaps a change in pre-teaching practices so that the teachers coming into the conversation start with different dialogues. Congratulations on a successful Edcamp.